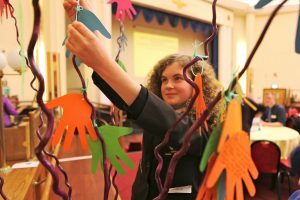 In March 2011, schools, SACREs, faith and belief groups, libraries, museums, local communities and anyone with an interest in RE participated in both local and national events which celebrated and publicised the value and importance of RE for the education of every child and young person. It highlighted the excellent work that is being done in RE and shone a spotlight on the subject for a whole month. This page captures some of the events that took place and also offers a range of useful and inspiring resources, which although written with March 2011 in mind can be modified and adapted for any time. with special educational needs or who are gifted and talented. In addition, there are ideas and activities for groups and organisations such as SACREs, museums and libraries and others. In engaging with the activities listed below, primary and secondary trainee teachers will have the opportunity to fulfil some of the necessary requirements for Qualified Teacher Status (QTS).